Johann (John) and Anna Margaretha (Margaret) Rau left the colony of Grimm in October 1899 bound for America. They sailed on the steamship Barbarossa from Bremen, Germany to New York, arriving in November 1899. The family migrated to Portland about mid-1901 and lived at 169 Knott St. until approximately 1951. 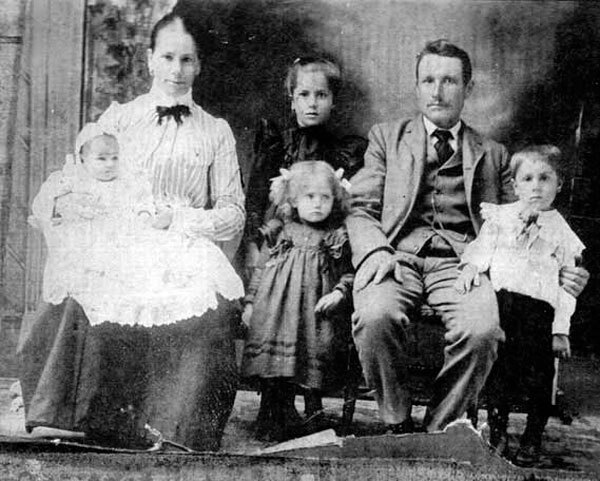 Photograph from 1902 of the Johann and Anna Margaretha Rau family in Portland. From left to right: Anna Margaret (Staehle) Rau, B 10-12-1871, Grimm, D 4-6-1953, Helen Margaret Rau, B 2-28-1901, OR, D Abt 1988, Emilie Rau, B 11-22-1898 Grimm, D 10-1-1992 (Mother of Eleanor Johnson), Anna Margaret Rau B 10-19-1893, Grimm, D 6-24-1982, Johan Jacob Rau, B 11-3-1868, Grimm, D 9-26-1951, Johan Jacob Rau II, B 5-21-1897, Grimm, D 6-28-1972. Courtesy of Eleanor Johnson. Information and photograph courtesy of by Eleanor Johnson.